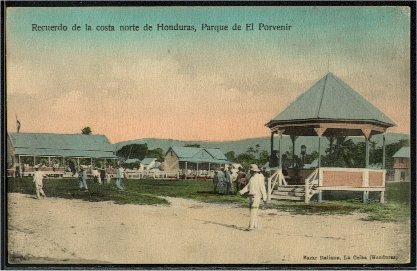 Lying along the beautiful Western Caribbean shore, La Ceiba Honduras provides an interesting cultural mix and is the closest mainland city to the Bay Islands. 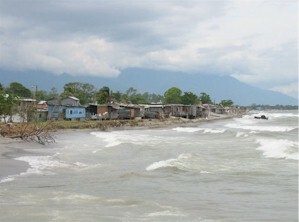 For Bay Islanders, La Ceiba is where we often shop and visit doctors and dentists or just get cured of "island fever". Being close to the Pico Bonito Rain forest and the Rio Cangrejal places La Ceiba in an excellent position for eco-tourism and adventure travel. La Ceiba tour operators can arrange rafting and hiking tours, as well as tours to the nearby Cayos Cocinos (Hog Islands), Cuero Y Salada Wildlife Refuge, Trujillo, Punta Sal, and Zacate River. Also, the new Casa Verde Yoga Retreat is now open along the Rio Cangrejal. See a Photo Gallery of a zip line canopy tours, white water rafting tours, and rock climbing tours all in the La Ceiba area. 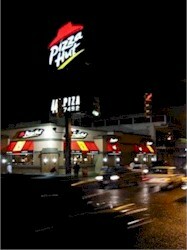 There are many hotels and restaurants to enjoy during a visit toLa Ceiba. 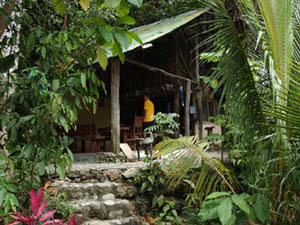 Be sure to check out the new Coco Pando Resort with its Iguana Restaurant and Bar and luxurious eco-lodge Las Cascadas. The downtown area (El Centro) has lots of stores and shops, and there is also a modern shopping mall housing a variety of businesses. There is an annual Garifuna celebration with music, dancing, and colorful costumes, and Carnival week with music and dancing, shopping, and fiesta atmosphere. A favorite hotel is the Paris; it is right in the middle of town, across from the Central Park, and it has a great swimming pool and bar for relaxing after the errands. And the favorite place to dine is Ricardo's on their lovely covered patio; anything on the menu with their "special" jalapeno sauce is delicious. 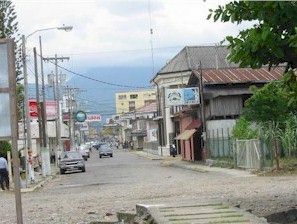 The photo to the left shows another popular La Ceiba restaurant. 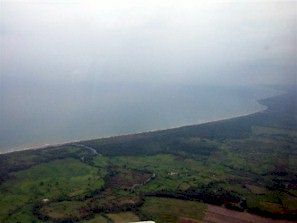 La Ceiba has its own airport and you can get there from the Bay Islands by air or by boat. Options for mainland ground transportation are also available: buses, vans and shuttles, and rental cars. Hedman Alas provides 1st Class Bus Service: San Pedro Sula (& airport), Tegucigalpa, La Ceiba, Copan Ruinas, Tela, Guatemala City, and Antigua. There is also the popular Butterfly and Insect Museum in La Ceiba that you can visit. 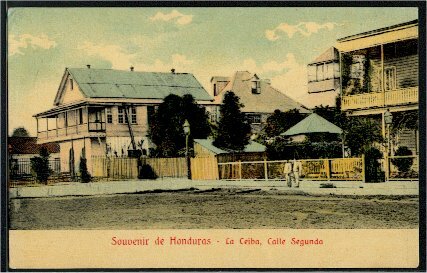 I'm not sure of the date for these old postcards showing La Ceiba scenes; they appear "turn of the century". You can find out more and see many others at www.postcardman.net. 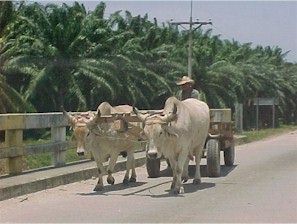 For La Ceiba Honduras Information; English version is not ready yet, but has nice photos of La Ceiba.